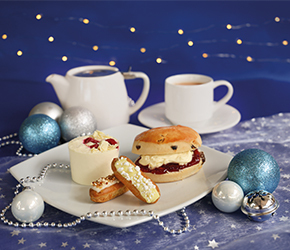 Indulge yourself with our exclusive Festive Cream Tea for only £7.95 per person. You will enjoy a choice of loose-leaf tea, a fruit or plain scone with jam and Roddas clotted cream, white chocolate and­ raspberry panna cotta & two mini pop eclairs. Available daily in December from 2:30pm at all centres. No booking required. Gluten free available.